The Bruins have won seven of nine and are one point back of NHL-leading Tampa Bay. 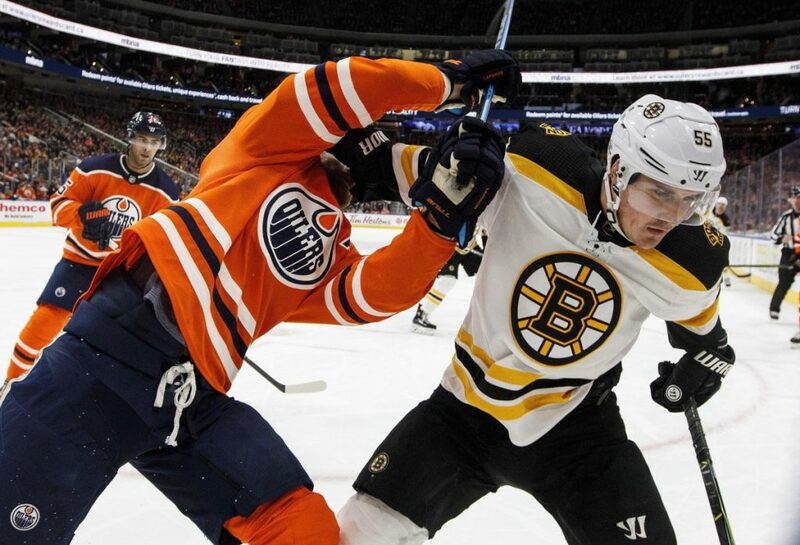 EDMONTON, Alberta – Patience paid off for the Boston Bruins on Tuesday night. David Krejci broke a tie with 1:04 remaining and Boston rallied for a 3-2 victory over the Edmonton Oilers. Noel Acciari and Matt Grzelcyk also scored for the Bruins (37-13-8), who have won seven of nine and are one point back of NHL-leading Tampa Bay in the Atlantic Division. Boston trailed 2-0 before scoring three times in the third period. The Oilers scored the game’s first goal with 1:31 left in the opening period – despite being outshot 13-2 to that point – when Strome beat Khudobin on a 2-on-1 break for his ninth of the season. The Bruins came close five minutes into the second when David Pastrnak’s shot clanged off the post behind Talbot, but instead the Oilers extended their lead just more than six minutes later when a knuckler by Khaira beat Khudobin up high. The shots favored the Bruins 29-14 through 40 minutes. Boston got on the board 4:37 into the third when Acciari swung a puck in front of the Edmonton net and it bounced off Strome and in to make it 2-1. NOTES: It was the second and final meeting this season between the teams. The Oilers took the first game 4-2 in Boston on Nov. 26. … Oilers defenseman Kris Russell played his 700th NHL game. … The Bruins acquired D Nick Holden from the New York Rangers for minor league defenseman Rob O’Gara and their third-round pick in this year’s draft. Holden was not in Edmonton in time for the game.